[The CDC’s] Immunization Safety Office posted a fact sheet that once again insists that “thimerosal in vaccines is not harmful to children,” despite ample evidence to the contrary. The Centers for Disease Control and Prevention (CDC) appears to agree that a big and oft-repeated lie is a powerful public relations tool, because in August, its Immunization Safety Office posted a fact sheet that once again insists that “thimerosal in vaccines is not harmful to children,” despite ample evidence to the contrary. The fact sheet trots out the same handful of thimerosal-related studies (“conducted by CDC or with CDC’s involvement”) that it has used for years to silence thimerosal critics. Fortunately, multiple resource pages on the Children’s Health Defense website make it easy to rebut the CDC’s regurgitated falsehoods. Our website provides a thimerosal FAQ, information dispelling myths about thimerosal’s use in vaccines and countering false vaccine safety claims (including claims about thimerosal), analysis of the flawed studies that the CDC relies on to exonerate thimerosal from any role in the childhood epidemics of neurodevelopmental disorders—and more. Below, we summarize three of the most obvious reasons to ignore the CDC’s latest attempt to pull the wool over the public’s eyes. All eight studies included in the CDC fact sheet involve lead or co-authors accused of fraud or known to have been involved in behind-closed-doors data manipulation or weighed down by serious conflicts of interest. As outlined previously by Children’s Health Defense and others, and as indicated in the preceding sections, there are a variety of reasons not to trust the results of the eight studies included in the CDC fact sheet—including CDC funding and other conflicts of interest as well as erroneous and fraudulent reporting of data. The table below summarizes the studies’ major problems. 2. 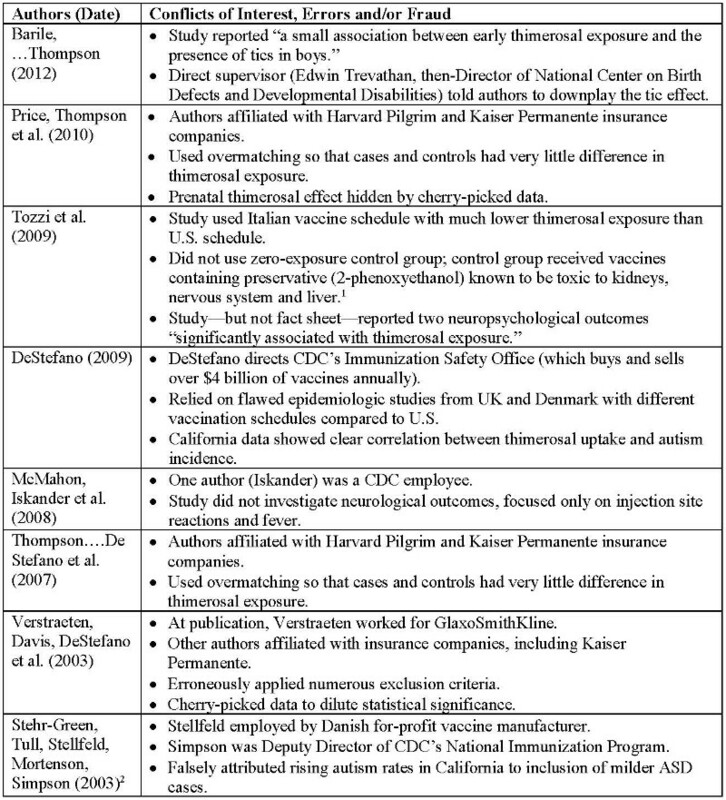 The CDC fact sheet includes the Stehr-Green study twice, formatting the study slightly differently in each of the two rows; although the duplication is immediately apparent to the attentive reader, a casual reader might conclude that the CDC had nine rather than eight studies at its disposal. At this juncture, with over 80 studies connecting the dots between thimerosal and autism alone, and new studies appearing every day that link other vaccine ingredients such as aluminum to the chronic illness epidemics beleaguering today’s children, the CDC has lost all credibility when it makes poorly substantiated claims about thimerosal or vaccine safety. An agency that buys and sells well over $4 billion of vaccines annually clearly has a vested interest in tamping down any discussion of vaccine risks. Fortunately, the public increasingly recognizes that the CDC’s “fact sheets” lies must be read with a large grain of salt. Our First Duty Is … The Truth!